I Googled around quite a bit and couldn’t find the instructions on how to set up a System Attendant. At least, that’s what we call it internally. Apparently the appropriate name is “Subscriber Access”. So I’ll use that term here. There is plenty of information about setting up Auto Attendants. But apparently no one writes about Subscriber Access because it is so simple to set up! Briefly – the role of Subscriber Access is to allow access to voicemail. In my case, I needed to provide a public DID number because people wanted to be able to call in to their voicemail from outside the office. I am assuming you already have set up your Exchange UM environment. If not, maybe you should read this article first. In order to set up Subscriber Access, you need to run the venerable OcsUmUtil.exe application. 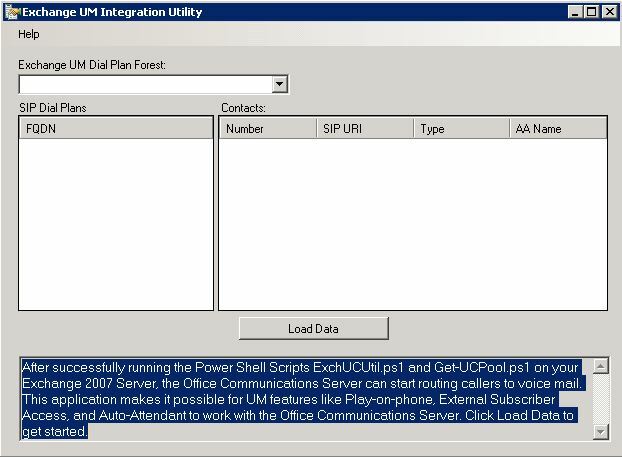 To run this, navigate to C:Program FilesCommon FilesMicrosoft Lync Server 2010Support on your front end Lync server. Once there, double click OcsUmUtil.exe. Once it has started, click on the Load Data button. The utility whirs for a few seconds and then brings up any existing Auto Attendants or System Attendants you may have defined. Click the New button in the lower Add… button in the lower right and you will see a new screen. In the Organizational Unit area, point to anywhere on your domain. A contact object gets created by this utility and so this lets you define where you want that object created. For name, give it a descriptive name. I usually make sure to add “System Attendant” to the name so as to minimize any confusion with and Auto Attendants. In Sip Address, type in a unique SIP Address that is not defined anywhere also in your SIP domain. I usually just take the description field and replace any spaces with an underscores. If necessery, select the correct SIP domain. Next enter the DID phone number you wish to assign for this system Attendent. Make sure to type it in using e164 format. Finally, make sure “Subscriber Access” is selected and click OK.
Just wait. For like 15 minutes. Active Directory needs to replicate this so if you have a large network you’ll have to wait until the contact you just created has made its way around your domain. Your subscriber access should now work. Pretty easy, huh?